My latest obsession is with all things French. Let me be more specific. 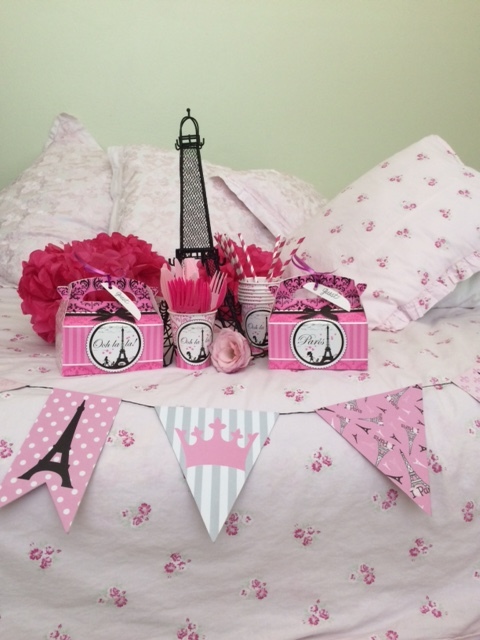 My latest obsession is with Paris-themed home décor, and figuring out how to use Parisian décor to create a French-themed party for my 12-year-old daughter. Why? First, my daughter has just completed a tough school year and is ready to celebrate the arrival of summer. Second, as any home decorating enthusiast will tell you, entertaining is just another excuse to design and decorate. 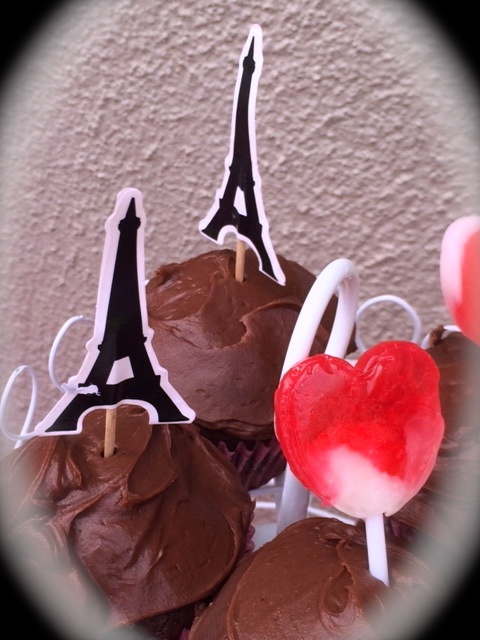 Voila, the genesis for my daughter’s “Spring into Summer” Paris Party! 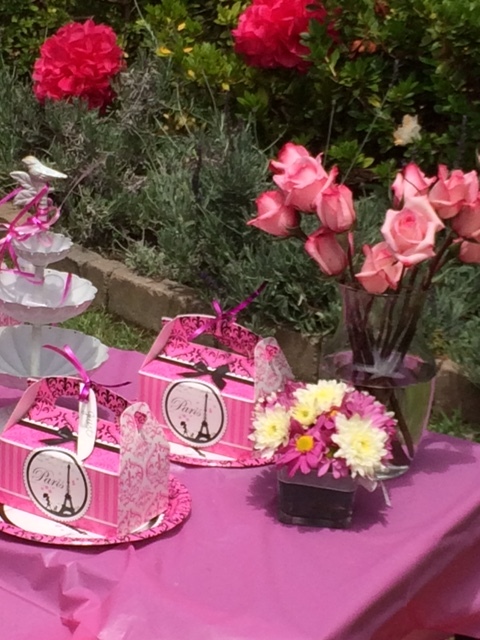 For this post, I decided to outline the steps I took to organize and design this really simple, low-budget Paris-themed spa party for girls, which can easily be modified to suit different ages, or for a ladies luncheon, tea party or bridal shower. 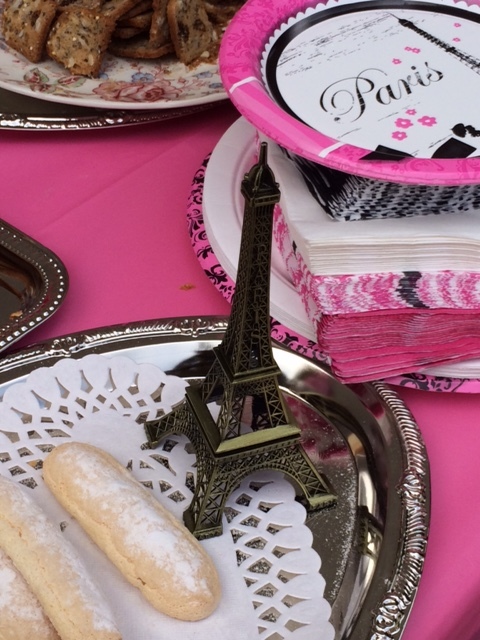 As a first step, I selected some ready-made Paris-themed party décor and a color scheme to set the stage: hot pink, light pink and black. 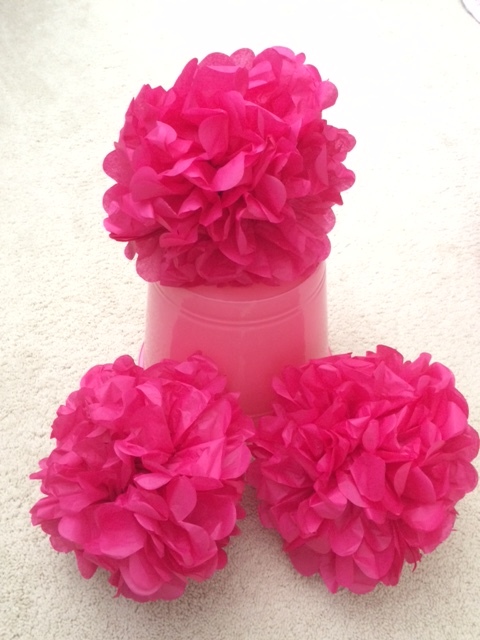 If you are into crafting, you could make your own party decor, but I decided to keep things simple by buying most of my supplies. I found many items at the Dollar Tree, including pink tablecloths, small containers for homemade spa treatments, and pink buckets to hold ice for cold drinks. I found more tiny containers and some little Eiffel Tower statues at Daiso Japan, where everything costs $1.50 per item. 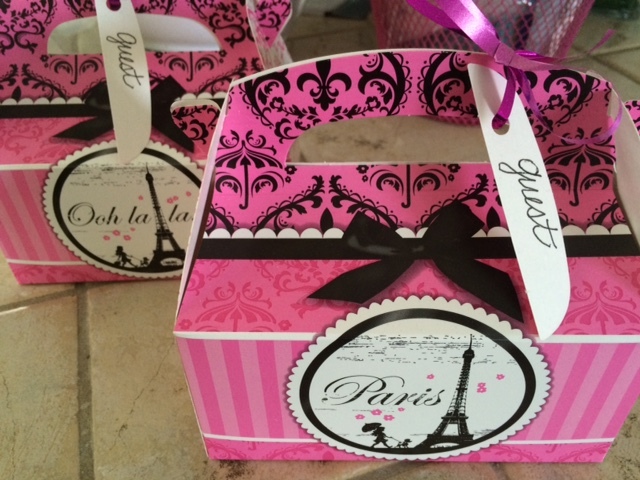 I chose hot pink, light pink and black as my color scheme partly because those colors are glamorous and girly, but primarily because the Paris-themed supplies from BirthdayExpress.com and OrientalTradingCompany.com already come in those colors. If you’re making your own supplies, you might opt for pale pink and white for a Shabby Chic Paris look, tailored black and white for a Coco Chanel vibe, or black and gold for a Vintage Paris party. It is best to coordinate your party look with just one or two dominant colors and one accent color. 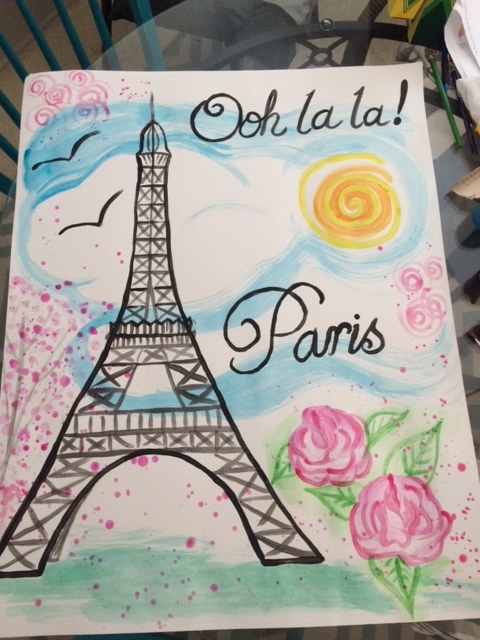 Gather Ideas and Visual Inspiration for Your Paris Party…and then Go Shopping! I hopped onto Pinterest to gather ideas. I typed the search terms “Paris party” and found plenty of inspiration. I also got a bit overwhelmed. 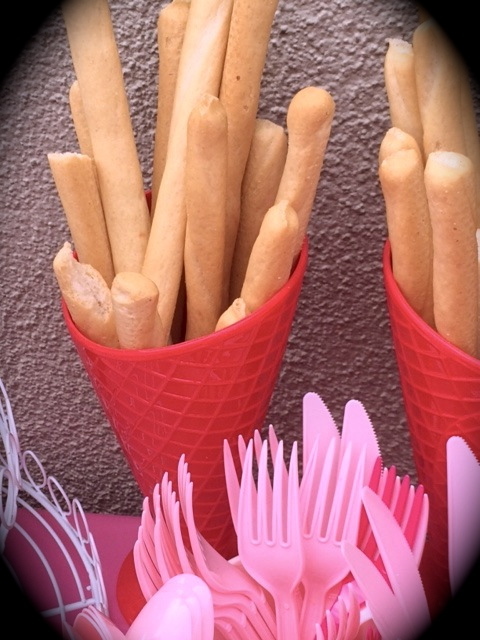 There are some amazing party organizers out there who approach entertaining as high art! 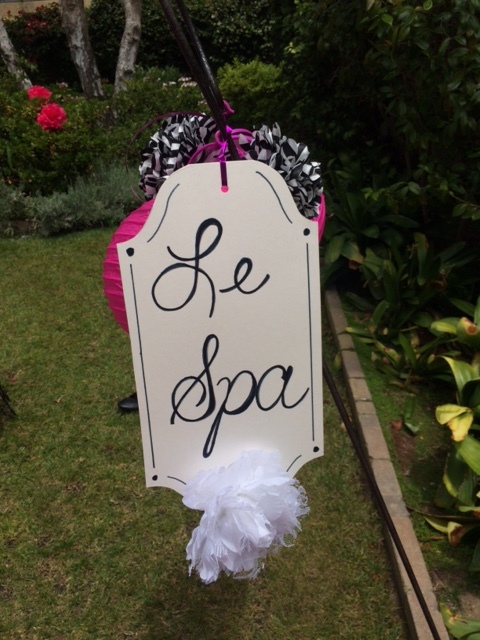 Since I was planning a spa party in a garden courtyard for a group of pre-teen girls, I decided my version of a Paris party didn’t have to be too fancy. I recommend you simplify your search, as I did, by using available party decor to help you decide on a color scheme and a few decorating elements. Just one or two elements are enough to convey your theme and coordinate your look. You don’t need to go overboard and get every item available in the product line–a little can go a long way. Repurpose, rent or borrow a rectangular table to push up against one wall (or at one side of your garden) to use as your buffet/food table. Drape it with a tablecloth in your color scheme and add a centerpiece. 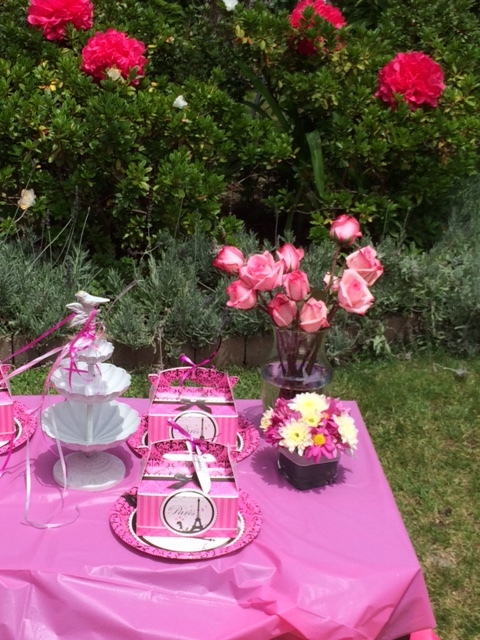 I draped the food table with a $1 table cloth from Dollar Tree and decorated it with vases of pink roses and Eiffel Tower figurines. I arranged food dishes and beverage containers of varying heights and shapes to create an easy-access food display with taller items in back and shorter items in front. Trays lined with doilies lend a romantic flair to the treat table. If you are a “non-cook” like me, you can buy most of the food from this menu pre-cooked or pre-prepared from Trader Joe’s. You’ll just need to be creative by mixing sauces and other ready-made ingredients together to infuse basic foods with French flavors. For example, I mixed apricot jam into the New Orleans barbecue sauce to add an element of Provence to the mix. The pasta salad was tossed with a container of TJ’s pesto sauce, since basil is often used in French Country cooking. I set up a spa table in the corner of the courtyard, draped it with a Shabby Chic bedspread, and supplied it with a stack of mixing bowls, a container of mixing spoons, measuring cups and measuring spoons, a basket of tiny containers to fill with spa treats, and all the spa-making ingredients needed for making homemade lip gloss, a facial masque, and body scrub. 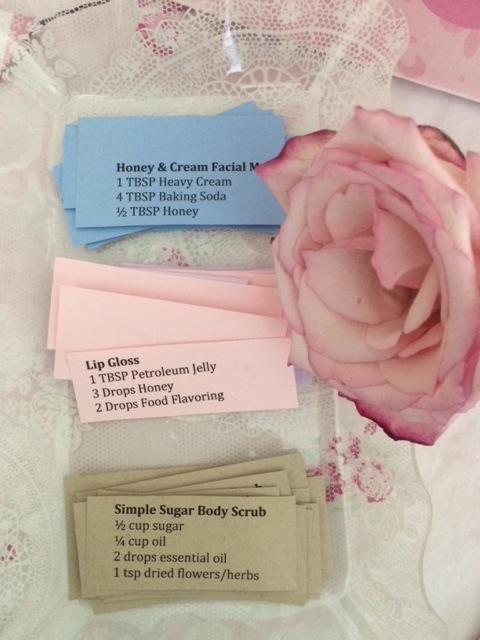 I printed out the recipes for each spa treat on small cards and placed them on a tray at the front of the spa table so that guests could grab a recipe, and add the basic ingredients they needed to a bowl. Once they had their basic ingredients in a mixing bowl, they sat down with a partner to decide on which essence oils to add before mixing up each spa treatment and filling their little containers to take home. All the recipes I used are non-toxic (and even edible, so safe for little kids), but adult supervision is recommended during mixing to avoid a mess or over-saturating a mixture with the too much food flavoring or essential oil. 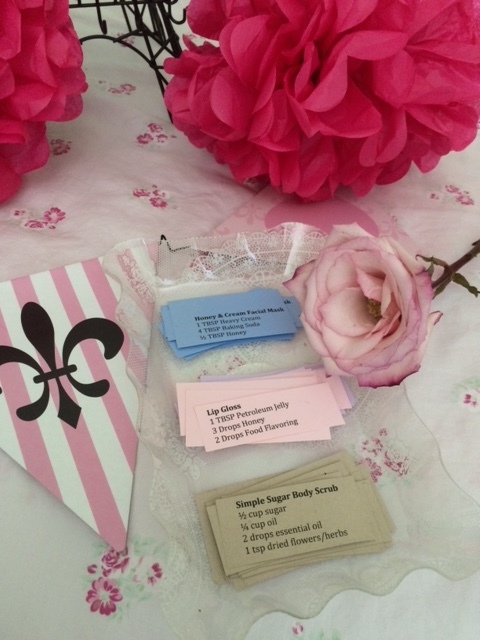 Guests each received a party favor box tagged with their name on it as part of the place setting at their seat. Guests opened their boxes to find a selection of empty spa containers to use at the party, along with self-pampering treats like a French sachet or soap, an eye masque, and a French Manicure nail polish to take home. After the guests had eaten their fill of French foods, we organized everyone into pairs and had them mix up their spa treatments together. Since I was busy taking photos of guests at the “French Photo Booth” equipped with a selection of French-inspired props, I didn’t have time to demonstrate to the kids how to mix up the spa potions. Luckily, the adult women in attendance stepped in to help out (Merci beaucoup)! For the French Photo Booth I bought a white sheet of poster board at the Dollar Tree and painted a Parisian-inspired scene on it to use as a backdrop for photos. 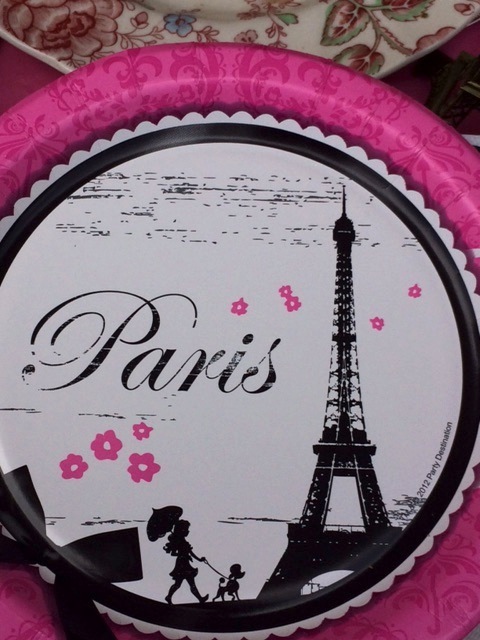 If you’re not artistically inclined, you can purchase a selection of Paris-themed backdrops from BirthdayExpress, OrientalTradingCompany and other party supply stores. You might also spray paint an empty, ornate picture frame in black, white or pink, and have guests hold it up to frame their face for their Kodak moment. I ordered a set of “Paris Party” photo props from the online party supply store, which made for some fun photos that I emailed to everyone after the party. As party hostess, I was running around too much to stop and take proper photos of the entire set up before the party had ended. Luckily, a friend of mine who attended with her daughter helped me clear away some of the clutter and chaos in time to grab the few snapshots you see here. 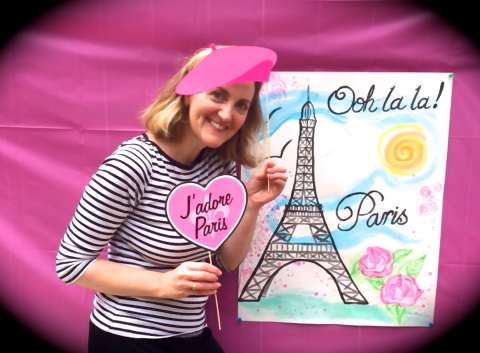 All in all, this “Spring into Summer” Paris Party for girls was a fun time for all and fairly easy to pull together. For a few short hours, our courtyard was transformed into Spring in Paris for une belle fete! How a shabby chic furniture refurbisher took an unexpected detour and found a one-of-a-kind treasure with sentimental value. 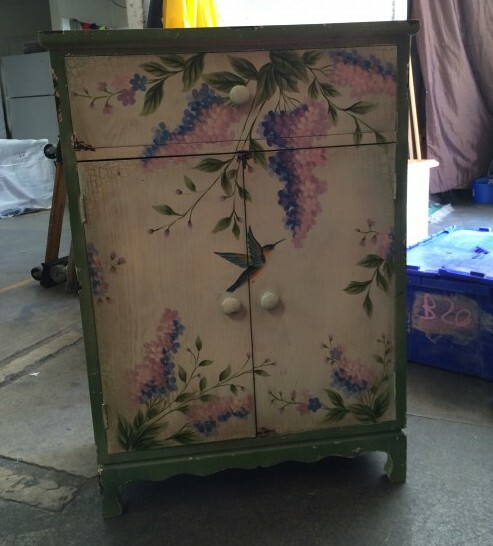 A one-of-a-kind painted cabinet is a treasured find for a shabby chic home. My heart fluttered when I saw it. 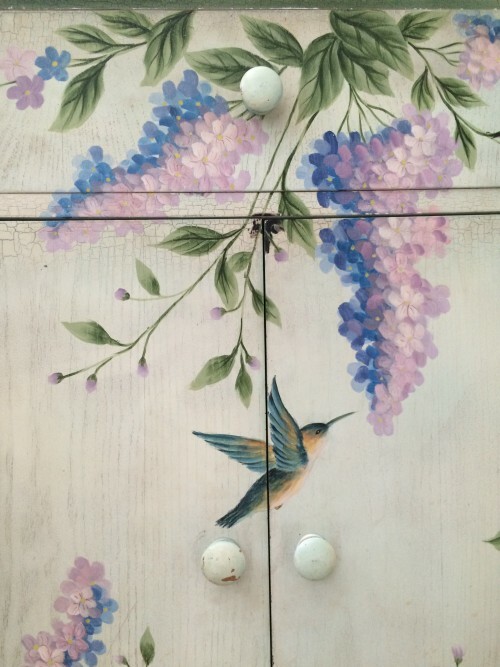 A vintage cabinet that had been beautifully hand-painted with a rendering of a hummingbird hovering among wisteria vines and lilacs. 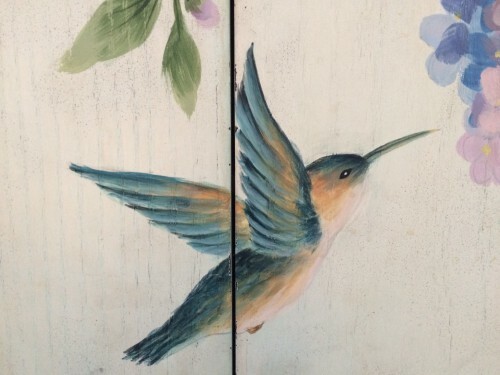 This work of art was already perfect—no refurbishing required—and it instantly reminded me of my maternal grandmother who had adored hummingbirds. I had to have it! I’d popped into this thrift store while I was running my weekend errands, just for a quick browse to see if they had any vintage furniture pieces that might lend themselves to a white-washed, chippy paint, shabby chic look. The hummingbird painting on front of the cabinet. After hunting among a limited selection of boxy media cabinets from the 1980s for my next furniture project, I’d almost given up. Then I spotted a small vintage wooden magazine rack that I could immediately imagine refurbished with white paint. I picked it up to get a closer look, and that’s when my eyes strayed down to the cabinet upon which it had been placed. 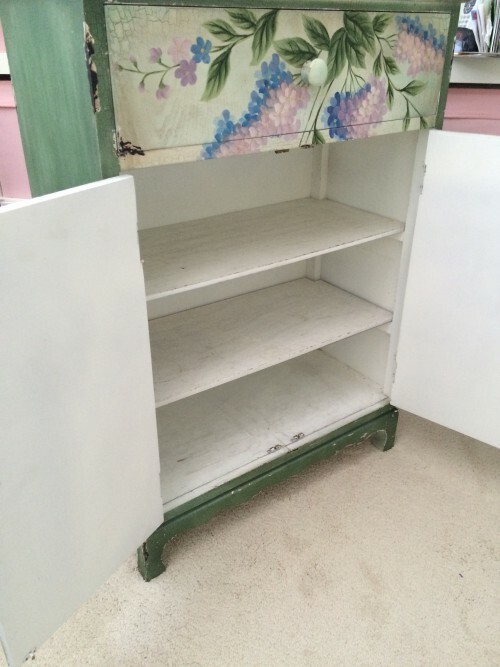 The top and sides of the cabinet had been painted a sage green with chipped corners, which was nice. But the front was the real surprise. It had been painted a creamy color, and then covered with a delicate study of flowers and a single hummingbird—all done in pale lavenders, blues, greens, and pinks, which were all my grandmother’s favorite colors. (I stood there thinking: Are you seeing this, Grandma?) I have a quilt at home that was handmade by my aunt in fabrics of the very same hues, which I love, too. I found a price tag taped to the inside of the cabinet’s door. It had been priced at $124, then had been marked down to $99, and now had a 40% off sticker taped over that. Yay! Why hadn’t this thing of beauty sold at $124? It was worth twice that. Never mind, it was mine now! I couldn’t see a clerk anywhere in sight, and I didn’t dare leave the cabinet for a second for fear someone else might nab it. (Did I already mention that it matched my heirloom quilt exactly?) So, fool that I am, I dragged the cabinet by myself to the back of the store, and stood guard beside it while trying to flag down a clerk to help me. The cabinet just needed a light cleaning with a moist wipe to remove surface dirt. Once I got it home, my hummingbird cabinet didn’t need more than a gentle cleaning with a moist baby wipe. Otherwise, it’s chippy paint finish is perfect as it is, and looks quite at home in my shabby chic apartment as a storage cupboard for my art supplies. 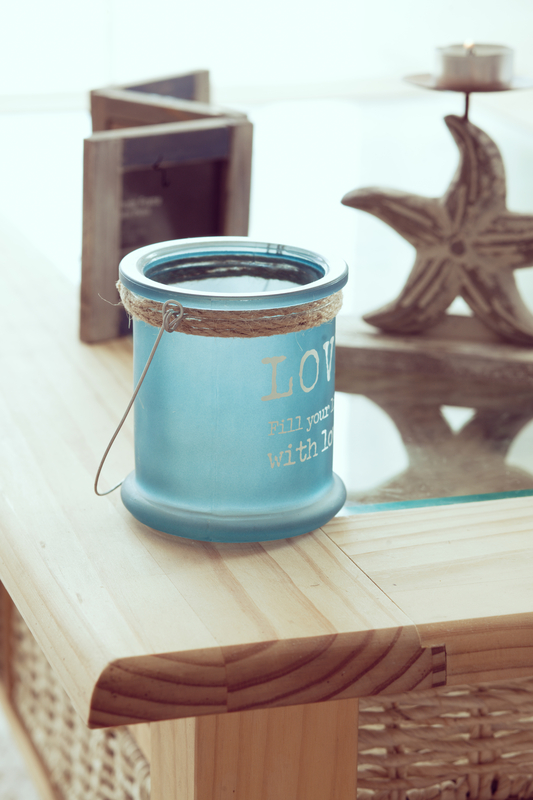 A functional and beautiful treasure with an aged patina…a perfect combination. There is another hummingbird that figures into this story. Sure, painted furniture is a key component of shabby chic style, so sourcing one-of-a-kind painted furniture pieces like this falls within the parameters of a shabby chic treasure hunt. But…the real reason I fell in love with this cabinet was because it reminded me so much of my grandma. It was almost like she’d been shopping with me and noticed it at the exact moment that I did. Grandma loved hummingbirds. For as long as I can remember, she kept hummingbird feeders hanging outside her kitchen window and loved to to watch them fluttering about those feeders with their jet-speed wings. Grandma received a lot of gifts over the years that carried the hummingbird motif. She even bought kleenex boxes that were decorated with hummingbirds. One of those kleenex boxes figures into this story, too. My aunt once made a gorgeous watercolor quilt — a quilting style that looks more like an impressionist painting than a patterned quilt. 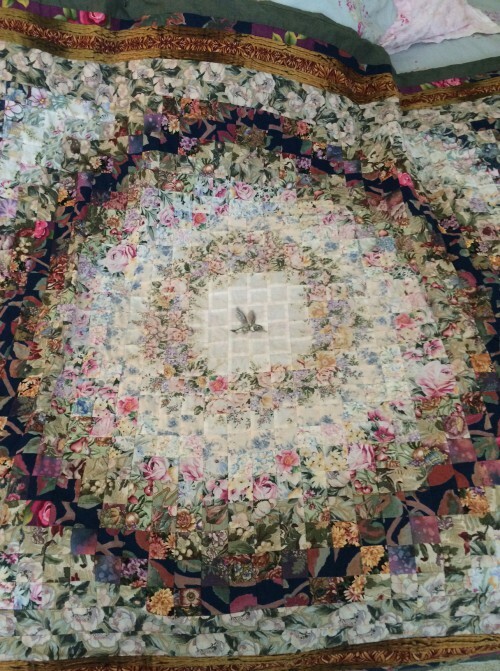 This quilt was crafted with floral fabrics of purple, blue, pink and green, with a plain, cream-colored circle at the center of the design. After my aunt hung the quilt on the wall, grandma decided it needed something in the center. 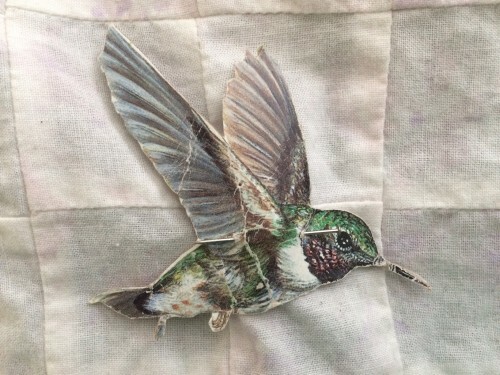 One day while my aunt was out, grandma cut out a hummingbird image from her kleenex box and pinned the little bird to the center of that quilt. After grandma died two years ago at the ripe old age of 100, my aunt had to pack up the house and let it go. Knowing how much I love that quilt, she gifted it to me. After she’d washed it and was packing it up for me, I asked her if I could also have the little cardboard hummingbird that Grandma had pinned to its center. “Of course,” she said, “they belong together.” And she tucked it into my suitcase with the quilt. I’m no Rachel Ashwell. In other words, I’m not the founder of a home design empire, nor the veteran of countless years of vintage furniture shopping and refurbishing. However, I’ve read nearly all of Rachel Ashwell’s design books, poring over pages and pictorials that describe how she sources old pieces that have just the right shabby chic vibe, and spruces them up until she achieves that romantic “old-new” look. As described in “Rachel Ashwell’s Shabby Chic Treasure Hunting and Decorating Guide,” she finds special pieces that others might overlook, and gives them a fresh, new look that deserves a coveted spot in a “shabby chic” home. I need a new coffee table for my tiny apartment, and I’m going to try and replicate Rachel’s methods. How hard can it be? With hours of research under my belt, I head off on a “shabby chic” junket. 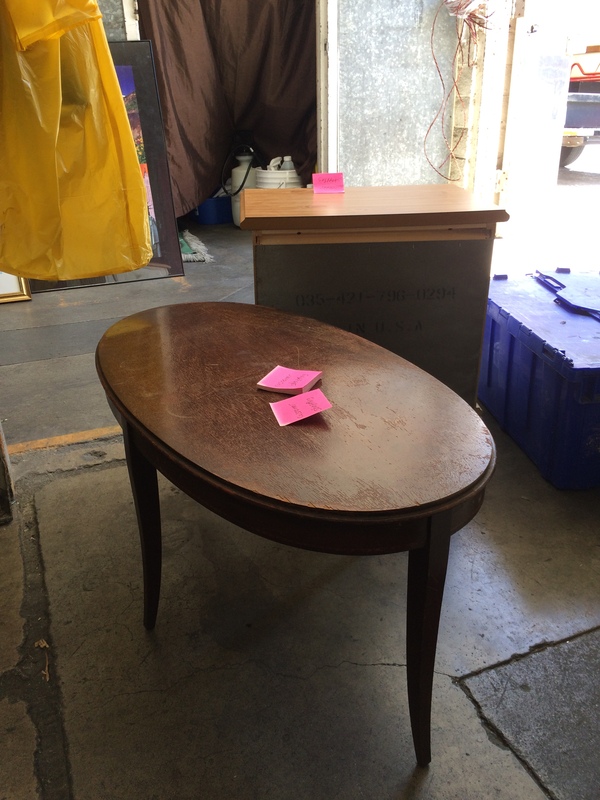 I scour thrift shops in the Beach Cities of Los Angeles to find the perfect piece of furniture that is calling my name. I’m going to test out my “eye” for design and keep a lookout for a table that will lend itself to a cottage or shabby beach style. I need to keep an open mind, but the coffee table must: 1. Be round or oval; 2. Have romantic lines; 3. Look good painted white; and 4. Fit into the trunk of my Toyota. After perusing aisles of battered bunk beds and deck furniture, I find it. 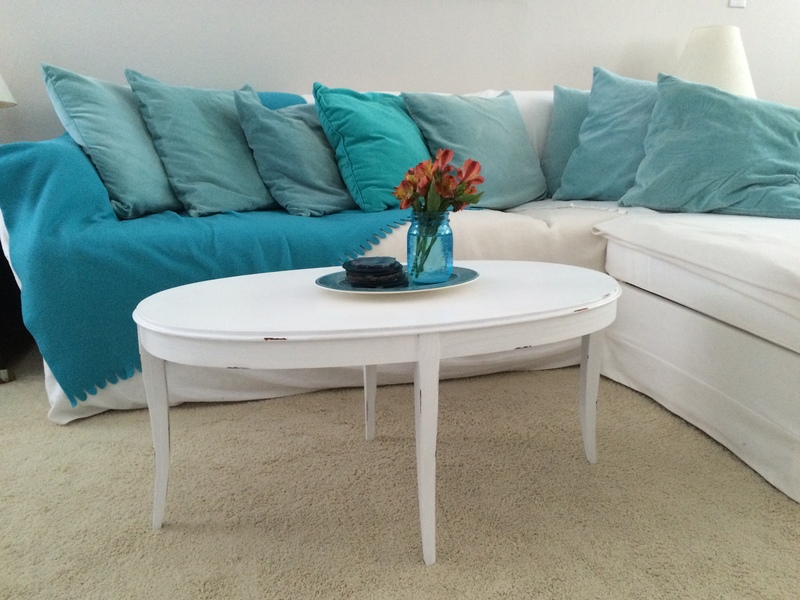 A small, oval coffee table that will look perfect painted white. Bonus: It will fit in my car trunk. 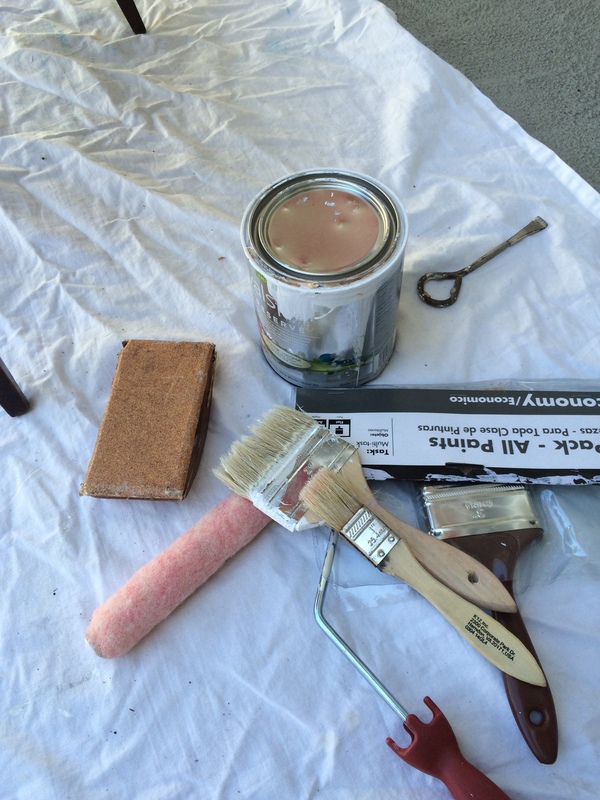 Once I get the table home, I spread out my handy paint cloth and gather my tools. 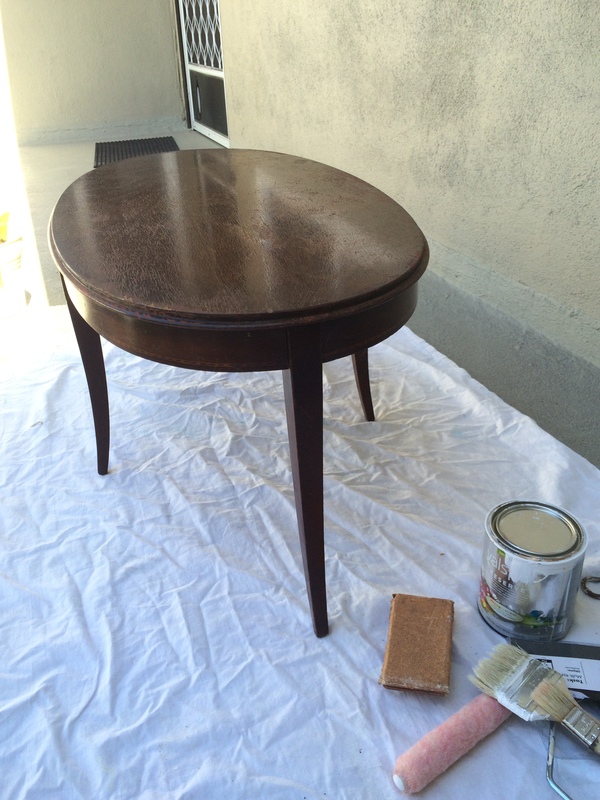 It’s best to find a spot outside for this work, because the whole refinishing, white-washing thing can get messy. Also, I wear a mask to protect my airway from all the dust I’m about to create. I usually pick up some painter’s masks when I buy my other paint supplies. I wear my glasses in lieu of eye protection. I’ll need heavy duty sand paper, a couple of soft-bristle paint brushes, primer, and paint. I can buy most of my supplies at home improvement stores like Orchard Supply Hardware, or directly from paint stores like Dunn-Edwards Paints, or Sherwin Williams Paint Store. Many people favor Benjamin Moore paints, but I like them all. The first step is to sand the old finish off the table–at least enough to rough it up and give it some “tooth” that a fresh coat of primer will stick to. Note to reader: If this is your first shabby chic refinishing project, start out with a small furniture piece like this coffee table. Why? 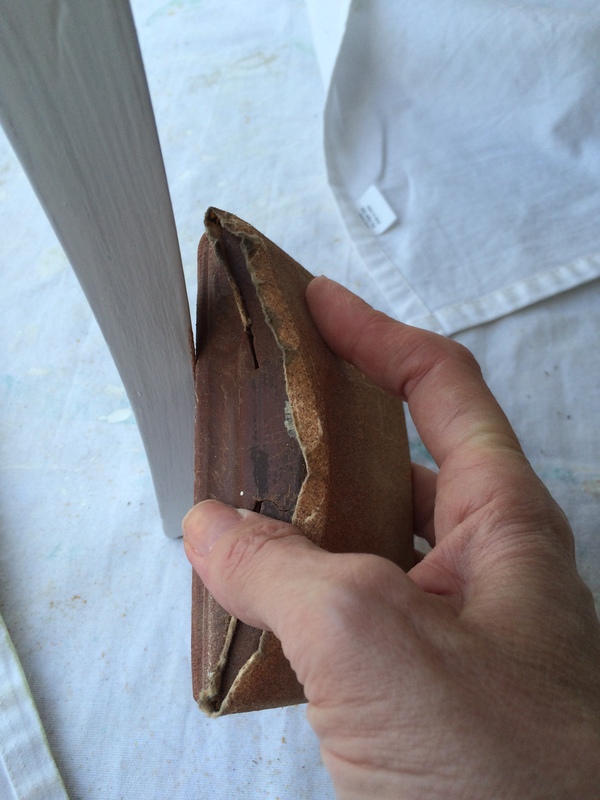 Sanding off the old finish, or even just roughing up the old finish, can take a long time and lots of elbow grease. I am sanding this table by hand. I wish I could say I was another “Rehab Addict” like Nicole Curtis, who loves her power tools, but the truth is, those things scare me! So, since I don’t want to devote an entire weekend to this project, and I’m not ready to invest in an electric sander, I’m starting small. Once I’ve “roughed up” the entire table from top to bottom, I wipe it down with a slightly damp cloth or dampened paper towel. I don’t want any bumpy dust spots sticking in my paint. Now I am ready to prime the table with paint. I use a satin finish latex paint for both my primer and my top coats. I have heard you can find a spray on primer, which would save me a bunch of time, but those little cans get expensive, and I know I’ll need more than one. I try to find traditional, brush-on paints in the sale bin at the big DIY retailers like The Home Depot or Lowes to use as my primer. I have gotten some great deals on paint that way in the past. 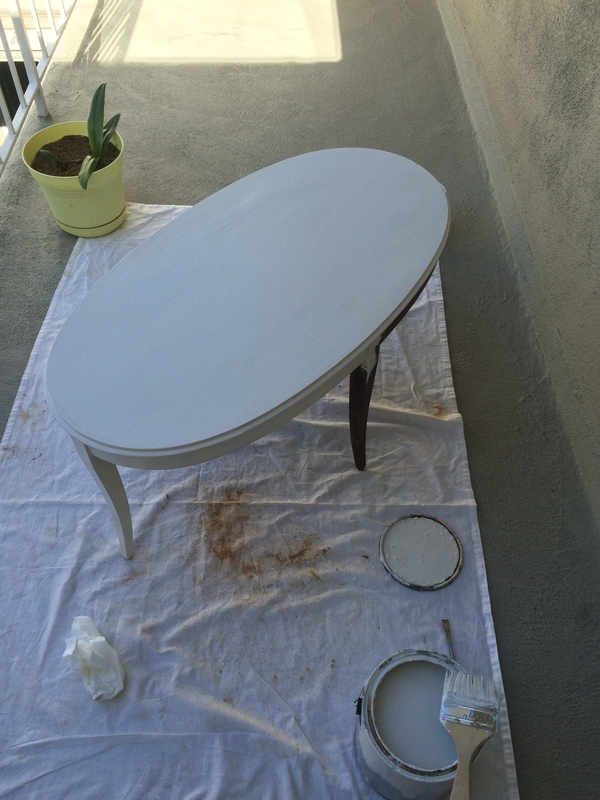 Since the primer doesn’t have to be an official “primer,” and it doesn’t have to be the final color, I’m going to use some off-white paint I previously bought on sale as the primer for this table. Once in a while when I’m looking for primer paints, I find a can of pure white, pale blue or aqua color paint in the sale bin at a fraction of the retail price. This happens when someone orders a custom-mix color of designer paint (even better, with no odor and low VOCs) that isn’t quite right for them, so they return it and it lands in the sale bin. So, word to the wise: Always check the sale bin at the home improvement store or paint store! I allow the primer coat to dry outside for about an hour. Once it is no longer tacky to the touch, I am ready to apply my second coat of paint. The second coat should be in the final color. In this case, I’m using a pure white or “Super White” low VOC latex paint in satin finish from Valspar. The “Super White” paint color from most brands or paint lines is comparable to the popular “Designer White” from Benjamin Moore. For shabby chic furniture, off-white shades can look nice, too. 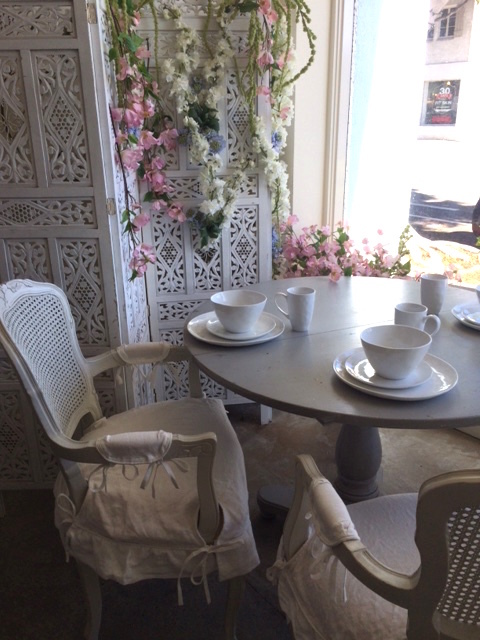 However, for bright shabby chic or shabby beach painted furniture, I can’t go wrong with a crisp, pure white. I know I need to let each coat of paint dry before I add the next one. 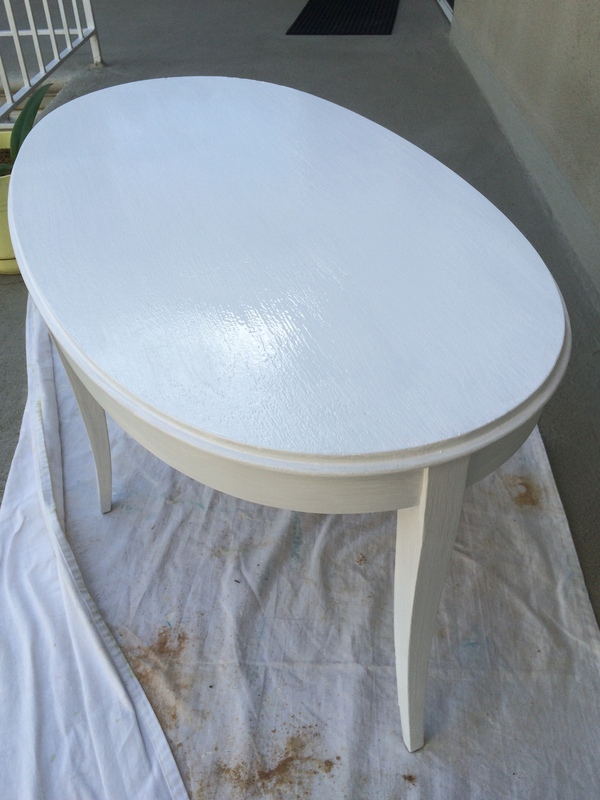 This little table needed one coat of primer and two coats of top coat, plus a few touch ups. Once I’ve applied the final coat of “Super White,” I need to let it dry for another hour. So, I’m off to have lunch and take a walk along the Palos Verdes cliffs overlooking the beach. It never hurts to get a little added inspiration in the middle of a project! 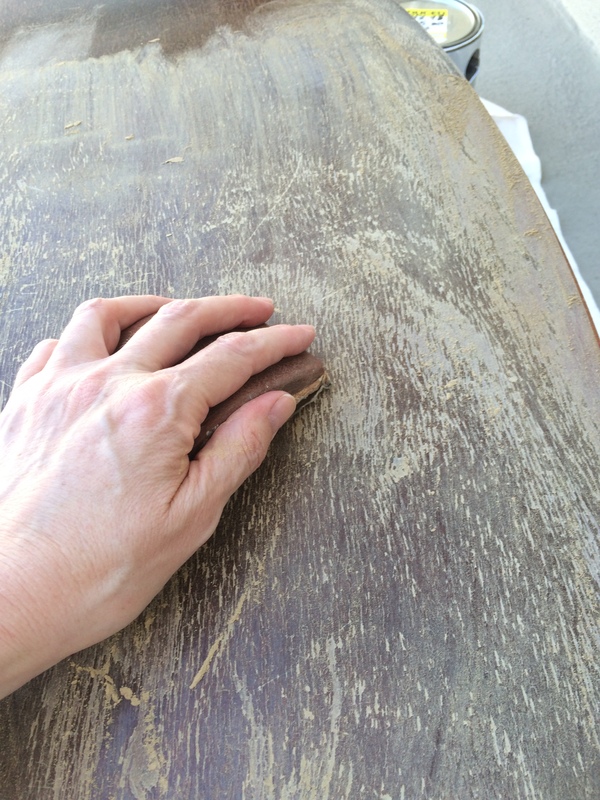 When I return to project central, I check to make sure the top coat or final coat is dry enough so that I can begin scuffing up my edges to recreate that “shabby” look. 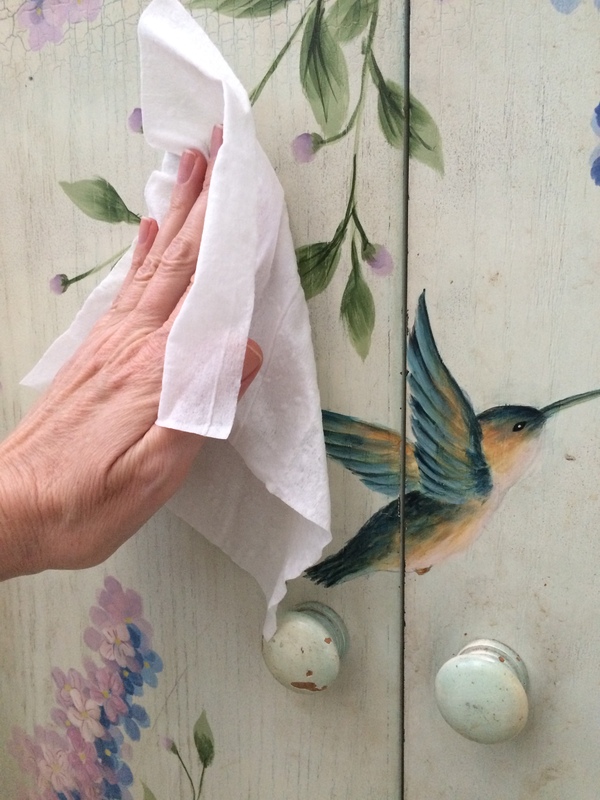 According to Rachel Ashwell and other shabby chic mavens, it is best to scuff up the edges that would most likely get bumped into and organically scuffed during the natural life of a piece of furniture. I’m looking for the most exposed edges along the table top and table legs. To get that “chippy paint” look I usually use a heavy duty sand paper (about #200 or so) attached to a sanding block. Sometimes I’ll use another rough tool like a patch of metal screen from a screen door or a metal file. I work my way around the entire table, using a relatively light touch with my sandpaper. I don’t want to overdo it! I’ve read that many people who re-sell shabby chic furniture will paint or spray a clear coat of varnish over their refinished shabby chic pieces, especially the edges or corners that have been artfully chipped or scuffed, to lock in the chippy look. I opt to skip this step. My view is, it’s supposed to look gently battered, so a few additional scuffs that happen along the way will just add to the look. Or, maybe I’m just lazy. At any rate, I’m ready to move the table inside and see how it looks in its new home. I move some things around, add accessories, and feel proud of myself that I completed this entire project in one day. And, I’m pretty happy with the finished look of this little coffee table, which looks quaint in my tiny beach apartment by the sea! I hope you found this article helpful. If you did, or if you have a few shabby chic or furniture refinishing tips of your own to contribute, please feel free to add your comments here. I’d love to hear from you! I have a passion for home design. 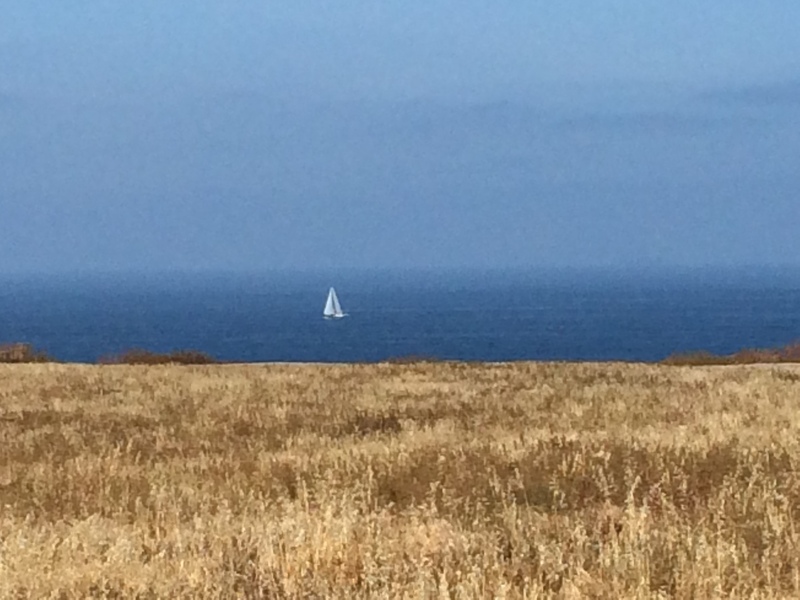 I also happen to live by the seaside in a California community filled with beach homes–from cottages to condos, and Cape Cods to bungalows, Spanish Revival homes to Santa Barbara haciendas, scattered among the early craftsman- and ranch-style homes. It is all prime real estate, sold by a local cadre of property experts who readily share their insights on the latest trends in home design and the preferences of buyers seeking some version of a coastal chic vibe. Home interiors here run the gamut from beach cottage or shabby beach, to plantation style and British colonial, with a bit of shabby chic and California casual mixed in. And, somehow, it all works! I’m certified in home staging and interior redesign, but even without those credentials, I’d still be trolling the local antique shops and flea markets to source “shabby beach” or “shabby chic” furniture and accessories for friends and clients. My idea of a perfect weekend is visiting a few “open house” showings to get a sneak peek of the architecture and design of interior spaces along the California coast. 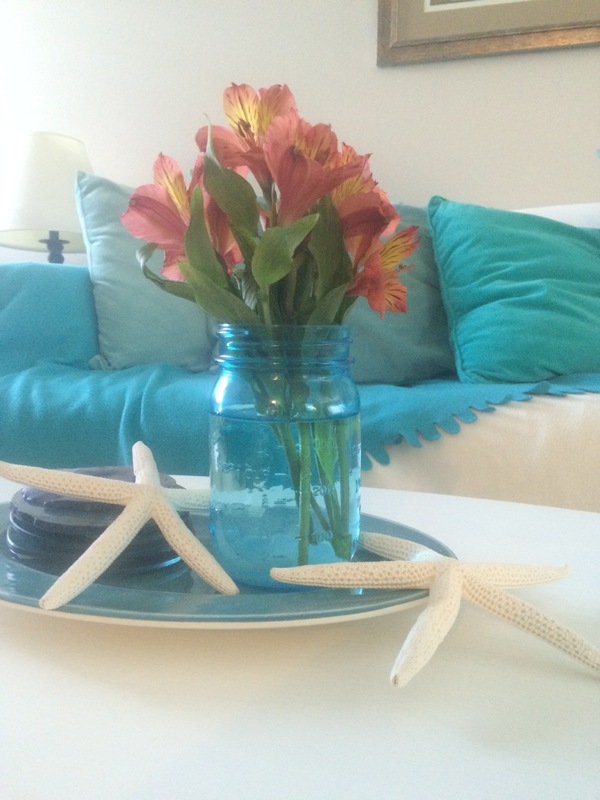 I love to see how people–other home stagers and interior designers, and creative homeowners as well–rock their own personal beach style, and reinterpret the quintessential coastal lifestyle. I gather a lot of ideas and inspiration along the way…many of which find their way into my own home and the homes I design with friends and clients. The great thing about beach style is that you don’t have to live by the beach to pull it off! 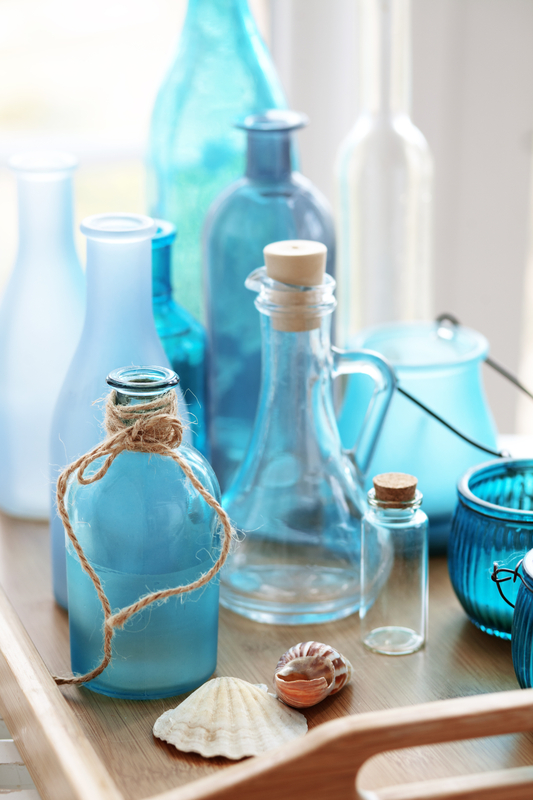 If crisp white linens, weathered woods, and the bluish-green hues of the sea are what you want for your interior space, it can work just about anywhere. It doesn’t matter if you live in a Chicago apartment, a Brooklyn boxcar flat, or a mid-century duplex closer to the mountains than the sea. You can even create a hybrid-seaside style by using richer hues or earth tones mixed with some subtle coastal or nautical accents. 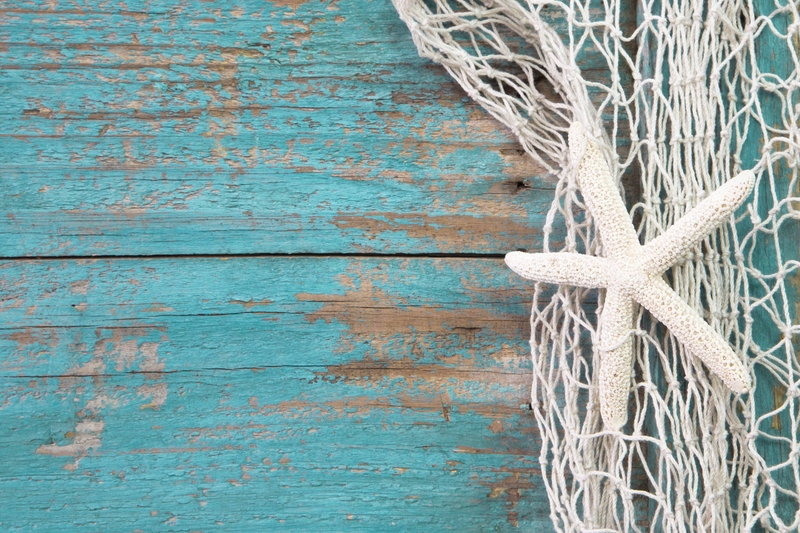 There are plenty of retailers and design companies that have picked up on the coastal-beach trend, and are offering a range of beach-themed home decor, furnishings and accessories at affordable prices. 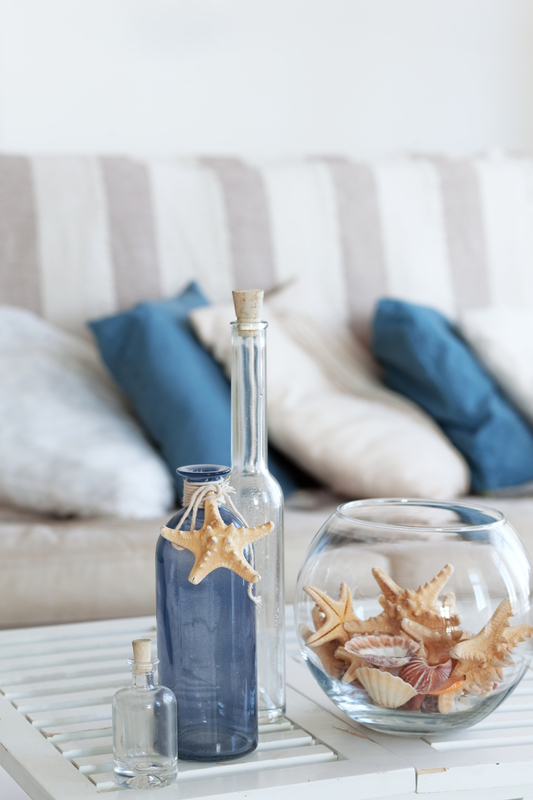 In this blog I share with you some of the sage advice, ideas, inspirations, tips, tricks, DIY projects, shops and bargains I’ve uncovered that will help you curate your own version of seaside style and create the beach home of your dreams.